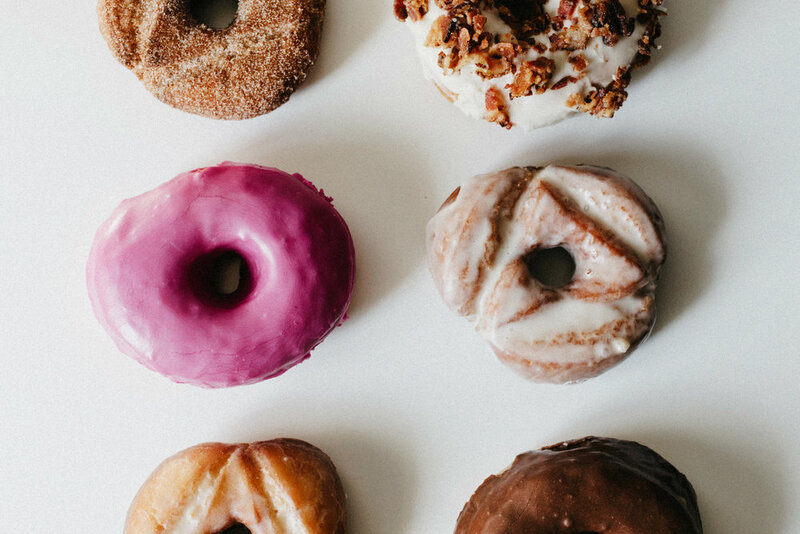 Menu — Bristol Doughnut Co.
We make our doughnuts freshly every morning with local ingredients to thrill the tastebuds of doughnut lovers in Albuquerque. A classically delicious doughnut. Cinnamon and sugar coating on our old-fashioned cake doughnut. Real maple glaze thinly coated on an old-fashioned cake doughnut. An all-time classic doughnut elevated with local cocoa from Chocolate Cartel. Thick cut bacon and real maple glaze on a fresh brioche doughnut. A truly New Mexican treat! Our brioche doughnut glazed in a prickly pear glaze made from locally soured prickly pears from NM Prickly Pear jelly. An old-fashioned cake doughnut with a sweet buttery glaze topped with sea salt. An Italian style doughnut dusted in fine sugar and filled with a pastry cream. Pillowy soft cinnamon roll covered in our salted butter glaze sprinkled with sea salt. A green tea matcha glaze topped with dehydrated strawberries. This doughnut is sweet, earthy, tart, and perfect for spring! A creamed honey and Meyer lemon pastry cream filled in our brioche doughnut.